The purpose of this document is to describe how the Untethering the Queue System will function and how it relates to existing services and systems. What is Untethering the Queue? It is a web service that allows the person in the queue to leave the premises but retain their place in the queue. 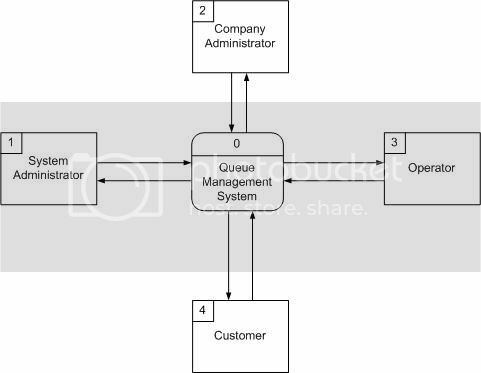 This document presents a design specification for the system to manage queues of people who want to avoid standing in line and return when their queue number is approaching the head of the queue. The system can use either a mobile phone or a web browser to register. How to develop Untethering the Queue? It is based on extensions of Joomla and uses some of the VotApedia audience response system logic. Scripting language of Joomla is PHP, and the database is MySQL. Both PHP and MySQL are open source softwares. Click this link to preview the Proposal for Untethering the Queue. First, the Company Administration files a request to the System Administrator in order to join the Queuing System. Subsequently, the System Administrator will give the password once the company has been allowed to join the system. The company administrator must then fill in the company data and their business operation system so that it will support the queuing process. First, a customer calls a premium number of the company to request a queue number. 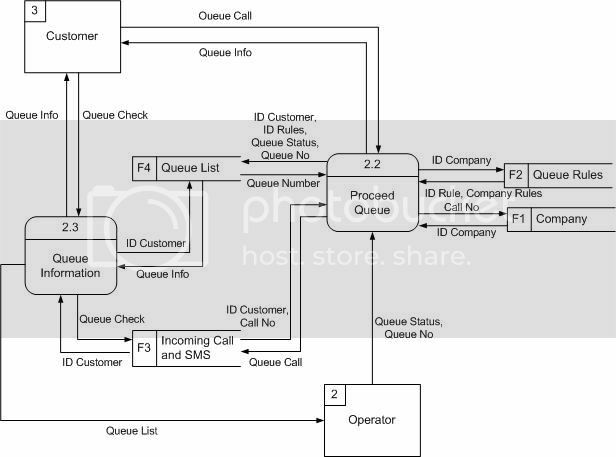 After the system receives a call, the system will process the call in the Process Queue. The Queue Call (customer phone number, premium number and time of call) will be saved in the Incoming Call and SMS table and automatically define a Customer ID. The Phone number will be saved in Phone number field, premium call in the Call No field and the time of call in Time field. Data in the Call No field will be used to search for the Company ID in the Company table. 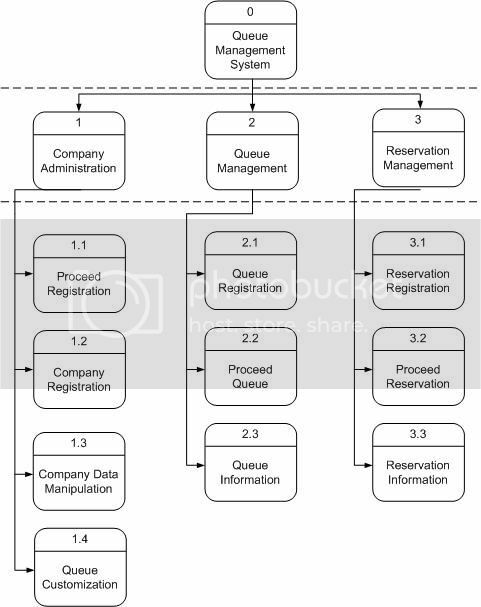 Upon obtaining the Company ID, it will be used to get the Company Business Operation System / Rules(Time Process, etc) in the Queue Rules Table. The ID Customer and ID Rules will be saved in the Queue List Table and will automatically be given a Queue Number. Queue Status will be set as default value which is 0 (where 1 indicates that the customer has been served). The Queue Info (Queue No and estimated time) will be sent back to the customer. The customer will be able to check the Queue status by sending a text message. In order to view said status, the message should consist of the ID number given by the system. 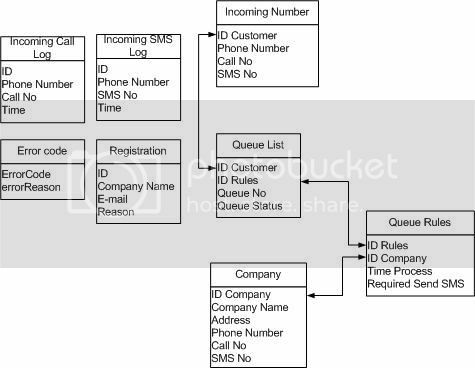 The system will process the Customer ID in the in the SMS table and then, with the Customer ID, the System will check the status in the Queue List table. 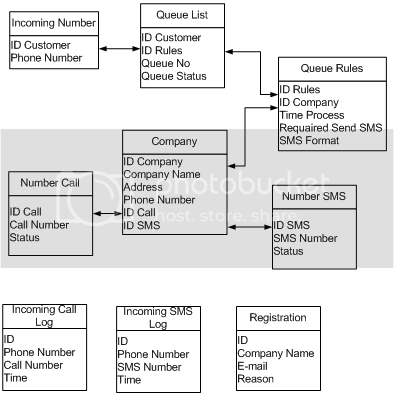 Making a DFD (data flow diagram), if required; a DFD is required if the main process of the software is complicated. For example: banking settlement is complicated, in this case DFD is required. User interface design for the company, the customer and the administrator. Queue Up by Call can change into Premium Call (future development). Make a button (with Flash/AS3) to access the queue from another site (not Queserv site). This button is embeddable, so it can be put on any company site. Make a php file that produces an XML which include all of the services provided by a Company. Do Complete testing on http://www.q.urremote.com. Sometime failed/operation aborted , when we access http://www.q.urremote.com from Internet Explorer browser ver.7 or older. Maybe add a button that says “click to print queue ticket”. So I can print out a ticket with the queue number. WEB Services link in Main Menu of www.q.urremote.com doesn't work perfectly. Link icon for print and email on every articles doesn't work. Make a page that able to display a person who already queue up by inputting their Reference Number. This is to give info to person who wants to see his condition in a queue e.g: Place of Queue Number and Estimation Time. Function Add new company and Edit Company on Company Manager(Administrator Page) not working yet. 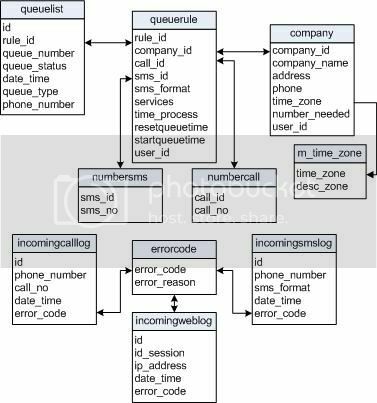 Update database (add m_time_zone table). Send all SMS from VotApedia to Queserv, and filter them by SMS format that appear on Queserv's Database. Explain about the Reference number in FAQ - by adi sukendra. Add new field "antri" on table "queuerule" to save the session value of variable "antri". Add new code for setting and getting value for encrypted ID in QueueVO.php(folder queserv). - by gus arik. Update new code (folder queserv) to repository SVN folder (https://svnserv.csiro.au/svn/VirtualWorldRockBreaker/queserv/trunk) - by gus arik. Update nusoapserver.php (folder queserv) fixing detail queues for each service. - by gus arik. Change email address on Contact Us's page in www.q.urremote.com (folder components\com_messaging\views\message\tmpl\default.php) - by gus arik. Update new code (folder components\com_messaging\views\message\tmpl\default.php) to repository SVN folder (https://svnserv.csiro.au/svn/VirtualWorldRockBreaker/queserv/trunk) - by gus arik. Make exception process on WEBServices's page (folder queserv\helloclient.php) - by gus arik. Update new code (folder queserv\helloclient.php) to repository SVN folder (https://svnserv.csiro.au/svn/VirtualWorldRockBreaker/queserv/trunk) - by gus arik. Update new code for supporting web services (folder queserv\helloclient.php) - by gus arik. Create new folder named "webservices" (folder components\com_queserv\views) for supporting webservices - by gus arik. Create new folder "webservices" (folder queserv\helloclient.php) to repository SVN folder (https://svnserv.csiro.au/svn/VirtualWorldRockBreaker/queserv/trunk) - by gus arik. Update joomla's database for supporting webservices - by gus arik. Update joomla's database (folder database) to repository SVN folder (https://svnserv.csiro.au/svn/VirtualWorldRockBreaker/queserv/trunk) - by gus arik. Create new folder named "lib" (folder queserv) for supporting webservices - by gus arik. Update new code (folder queserv\helloclient.php) and (folder queserv\nusoapserver.php) for supporting webservices - by gus arik. Delete file nusoap.php (folder queserv) because it's the older version, the newer version located in folder "queserv\lib" - by gus arik. Create new folder named "lib" (folder queserv) to repository SVN folder (https://svnserv.csiro.au/svn/VirtualWorldRockBreaker/queserv/trunk) - by gus arik. Update new code (folder queserv\helloclient.php) and (folder queserv\nusoapserver.php)to repository SVN folder (https://svnserv.csiro.au/svn/VirtualWorldRockBreaker/queserv/trunk) - by gus arik. Delete file nusoap.php (folder queserv) to repository SVN folder (https://svnserv.csiro.au/svn/VirtualWorldRockBreaker/queserv/trunk) - by gus arik. Update new code (folder queserv\nusoapserver.php) to show addition informations such as company name, company phone etc on webservices's page - by gus arik. Update new code (folder queserv\nusoapserver.php)to repository SVN folder (https://svnserv.csiro.au/svn/VirtualWorldRockBreaker/queserv/trunk) - by gus arik. Update new code (folder queserv\nusoapserver.php) to show addition informations such as number of services (1,2,3 etc) on webservices's page - by gus arik. Update new code (folder queserv\queueprocess.php) and (folder components\com_queserv\views\information\tmpl\queueprocess.php) for new reference number pattern - by gus arik. Update new code (folder queserv\queueprocess.php) and (folder components\com_queserv\views\information\tmpl\queueprocess.php) to repository SVN folder (https://svnserv.csiro.au/svn/VirtualWorldRockBreaker/queserv/trunk) - by gus arik. Update new code (folder queserv\queueprocess.php) and (folder components\com_queserv\views\information\tmpl\queueprocess.php) to remove '00' format in reference number's pattern - by gus arik. Update new code (folder queserv\queueprocess.php) and (folder components\com_queserv\views\information\tmpl\queueprocess.php) for new pattern of reference number and adding function to validate reference number to avoid duplicated reference number. - by gus arik. Update new code (folder components\com_queserv\views\information\tmpl\queueprocess.php) to Customize Reference number's font size on web Display - by gus arik. update new code (folder queserv\queueprocess.php) and (folder components\com_queserv\views\information\tmpl\queueprocess.php) to fix vowels problem in reference number pattern - by gus arik.